When you shop on AmazonSmile (smile.amazon.com), the AmazonSmile Foundation will donate 0.5% of the price of eligible purchases to the Educational Foundation for Rockport. Follow these instructions to sign up for AmazonSmile. Click on Accounts & Lists from the top of the page. On the next page, scroll halfway down the page to the box on the right that says “Shopping Programs & Rentals.” Click “Change Your Charity”. Select the Educational Foundation for Rockport at the top of the list. Make sure you are signed into your account. Remove the Amazon app (if you have one) from your iPhone and iPad so that you always shop through AmazonSmile. You’re done! 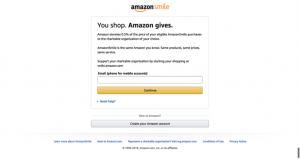 Thank you for supporting the EFR when you shop on Amazon.com!